This is the special exhibition edition. It was specially created for the Loitering With Intent Exhibition which took place at the People’s History Museum in Manchester in the summer of 2016. 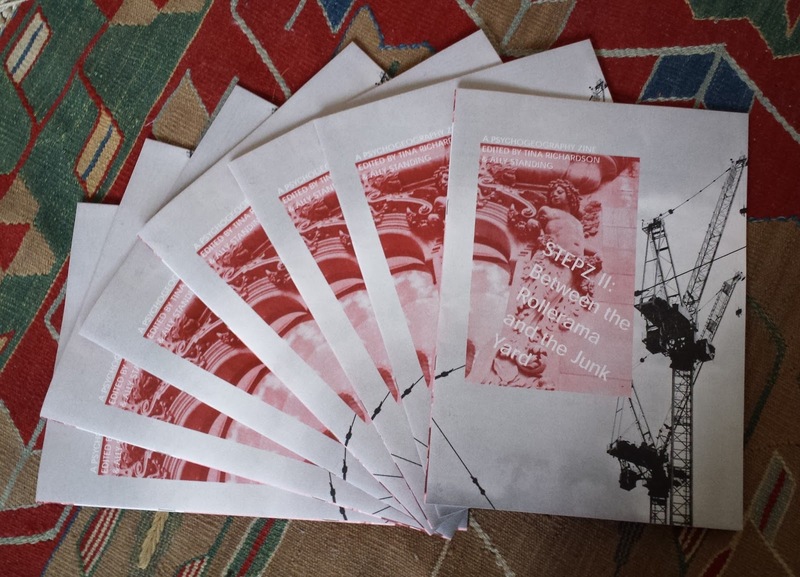 The zine has been edited and designed by Tina Richardson and Ally Standing. STEPZ II is inspired by the city of Manchester, Northern Psychogeography and the work of the Mancunian Punk Poet John Cooper Clarke. It combines written pieces with visual elements and is produced on a Risograph machine, creating a unique and vibrant aesthetic. Artwork and zines were made available at the exhibition, but ran out quite quickly. Due to demand we have produced some more of these not-for profit zines. The writing takes the form of poetry, prose and includes images throughout. Size A4. You can find out more about it here, or order a copy for £3.99 here. STEPZ II: Between the Rollerama and the Junk Yard. This is a grassroots zine about urban life and city aesthetics. It is written by creative writers, creative non-fiction writers and also those not from a professional writing background. As well as short essays, interviews and poetry, it also includes images specially created for the zine which appear in the form of cut-outs, maps, montages and photographs. Subject matter includes: CCTV surveillance, mountain climbing and W B Yeats. The publication is now in a specialist zine library in the USA and has been included on a course at Bowling Green State University. Edited by Tina Richardson. Size A4. This artist’s book is by Darrant Hinisco (artist and photographer) and is edited by Tina Richardson. It is based on the famous artist’s book by Ed Ruscha Twenty-Six Gasoline Stations. 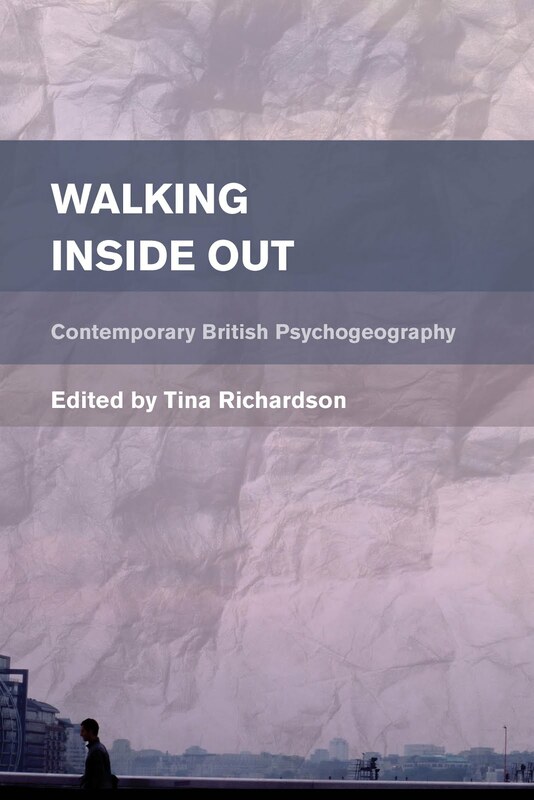 This is a truly psychogeographical artist’s book – just look up ‘Artist’s Book’ on Wikipedia. It faithfully follows Rushca’s format and style. It includes photography and captions throughout, plus an enclosed note from the artist himself. Size A5. 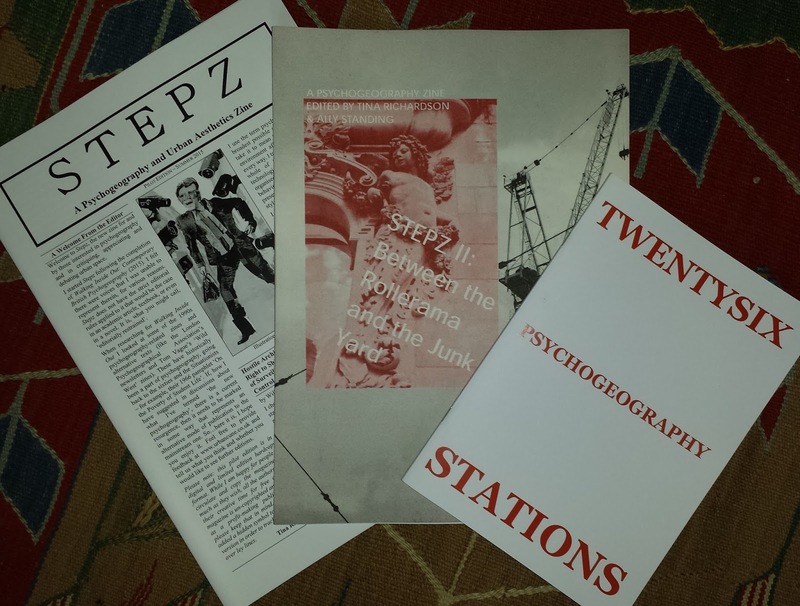 This bundle of three psychogeography zines costs £6.99 and is available here. For further information please contact Tina Richardson here. I think it was a coup for the conference to get such a high quality speaker when you consider the rest of the usual bunch of itinerant, rucksack-wearing, gore-tex fetishist types that made up the rest of the speakers at the conference – not that I’m bitter. Mr. Elborough was charming and gave an eloquent and entertaining talk about his book A Walk in the Park. 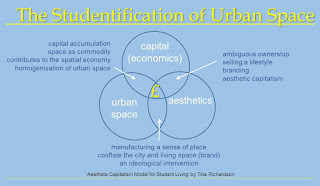 Richardson gave her usual affected talk, although I have to admire her for her shorter than regular talk title: Town and Gown: The Studentification of Urban Space. She must have really struggled to restrain herself. Coming from a critical theory background, she tends to over-embellish her lectures with, what I can only describe as, smartass deconstruction punctuation. I was surprised to see a distinct lack of bracket use and did wonder if she was perhaps feeling a bit unwell. Other than that, her talk was tolerable. Although she did set herself up for a ‘big reveal’, her model of studentification in Venn diagram form. Like this is the first time someone has ever used a Venn diagram in a presentation! These hyped up announcements invariably fall flat, like she did later that evening when leaving The Head of Steam public house. Alex Bridger’s Talk: What is Psychogeography? The famous (or should I say infamous) neogeographer Mr. Waters is just a sadist. Three of those attending his walk sought me out online ACTUALLY DURING THE WALK – knowing I was no longer with the world congress – to complain about the 12 hour long walk he took them on. And all with no proper toilet break and, worse, no alcohol! Darrant Hinsico, who had come all the way from Portugal, said "I was forced to tinkle on Harold Wilson". 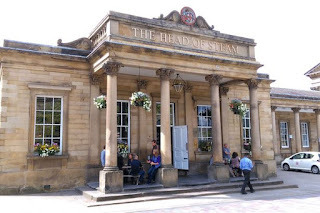 I also heard that a desperate splinter group actually stormed Huddersfield Town Hall after becoming so deranged after a lack of any “pep me up” (and I quote) that they began to hallucinate, thinking it was The Bastille. When I say Phil Wood’s presence, I mean 'presence'! Thankfully this psychogeographer not only kept the whole gathering on a professional footing, with both his flat cap and his Rob Rinderesque gavel, but also brought some gravitas to the event. To be honest, the man is wasted in this group of, what I can only describes as, losers! If I was Wood, and some have suggested that I am both he and also Luther Blissett, I would move across the Pennines and join the Western camp of the Northern Psychogeographers and get as far away from these idiots as possible! 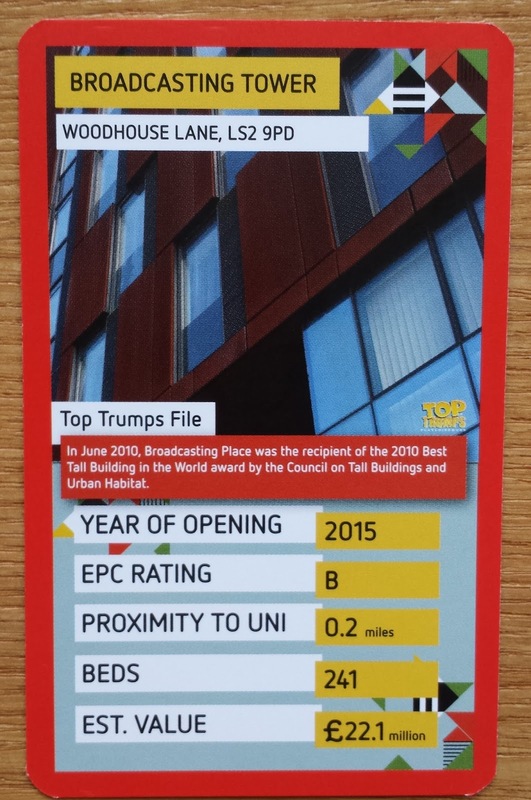 The cards feature Unite Group’s (or as they prefer to call themselves, Unite Student) student housing around the UK and instructions on how to play the game trumps (please see example below of some of their student housing in Leeds, right near Leeds Beckett University at Broadcasting Place). 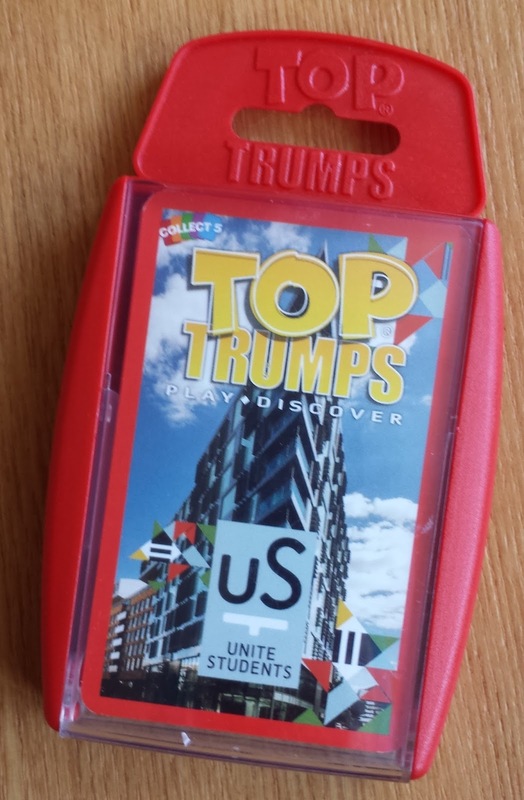 So not only can you see your own new home featured on the playing cards, but also those of your old school friends who are quite likely distributed around the country in one of Unite’s other student halls. Therefore you are already, in a sense, seeing something of yourself in the cards (I will build on this idea to make my argument). 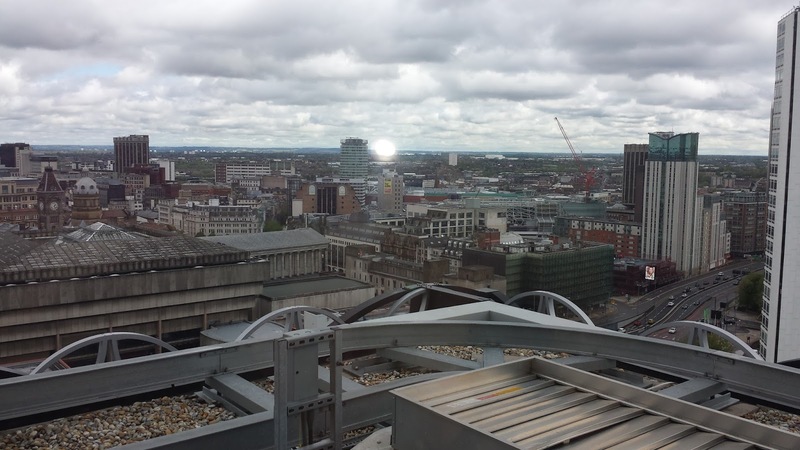 There are dozens of these properties, ranging from refurbished old priories and art deco flats to the postmodern flats you see in every city of the UK (they tend to look like they’re designed for ‘young professionals’ - with various degrees of architectural success). The cards actually tell you a little bit about the buildings. Some of the descriptions are useful and interesting, such as that for The Old Fire Station in Aberdeen: “The aptly named Old Fire Station actually still has a fireman’s pole inside”. 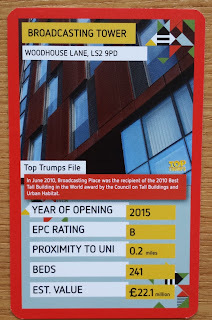 But some are just preposterous, such as that on the card for Purbeck House in Bournemouth: “The combined height of all the residents of Purbeck House is 870 meters, which is higher than the tallest building in the world; Burj Khalifa in Dubai”! So what is happening with these cards? What is operating on the unconscious of the students? How is this affecting their subjectivity? I am a cultural theorist and this is what interests me, after all. Let’s assume that they are being designed to actually be ‘played’ as a card game since as a marketing tool it is important that the individual cards are seen and that the company is valued for its vast property portfolio and ‘excellence’ in student housing (see my work on the term ‘excellence’ in regards to neoliberalism and higher education). As you can see above, the cards all include property values on them (I’m not sure if this was the value on completion or when the cards went to print). So, in a way, we could liken this to a game of Monopoly (which my friend, above, told me they also have a Unite game of). I have written elsewhere about how the system of higher education (now run as a business in ‘the third stage of capitalism’) aims to produce ‘good’ consumer-producers, rather than individuals with knowledge for its own sake. But, I think Unite Group has taken this one step further by fully integrating the student into the capitalist process (ideologically), thus becoming party to producing ‘the model student’. 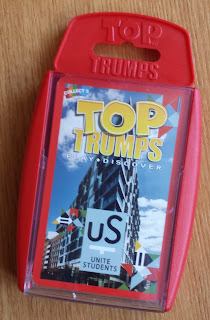 The model student playing Top Trumps, recognising that they are now partaking in the lived experience of a product of capitalism – i.e. 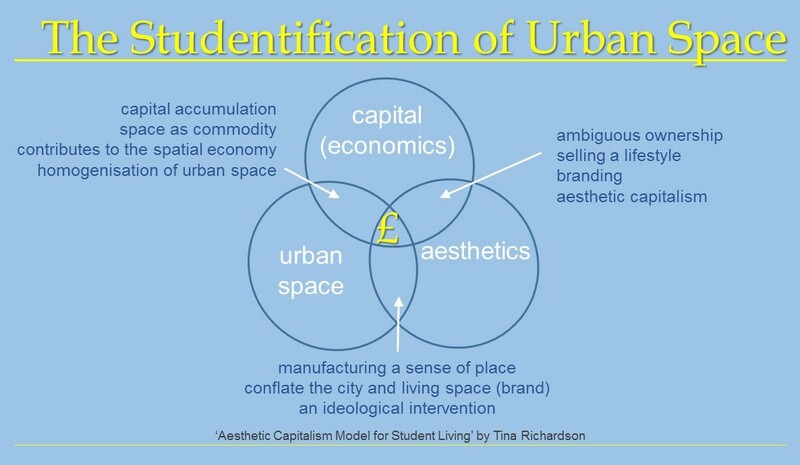 living in the Unite Students accommodation – is subconsciously recognising their future potential role as a ‘good’ capitalist (playing the game creates a mise en abyme effect). The game they are playing teaches them the rules in regards to property development/management. The instructions for the game says “The oldest i.e. with the earliest year of opening wins” (most profit in regard to long-term investment) and “The property closest to uni wins” (higher rent can be charged due to proximity). It teaches the student how profit-making works. What is ideologically happening is that the model student looks at the card and sees her future self. This is the mirror of recognition as espoused by Louis Althusser. Providing an example of Christian religion he explains that “God is the Subject par excellence”. It is essential for the Subject of ideology that He reproduces Himself in the form of His subjects; and since man has been made in the image of God he will see himself in Him. This is a misrecognition because the individual is not actually God. Althusser discusses this mirror relationship in relation to how the subject of ideology (the individual - in this case the student in the Unite Student accommodation playing the game) connects with the Subject of ideology (the power structure in which the ideology is located - in this case capitalism in the form of Unite Group) through a process of misrecognition. Althusser says that it is this “universal recognition” that becomes the “absolute guarantee” that subjects within the relevant apparatus will do what is required of them by the respective organisational body. It is essential that this ideological process be seamless, opaque and 'instinctive' for its subjects: in other words, natural. Althusser says that the effect of this subjection is that it seems like a normal state of affairs - it is just the way things are. The Unite Trump Cards are the mirror which situates the student as a subject in the machinery - the ideological apparatus - of capital. Not just as a consumer-producer, in the way the university ideologically produces students, but actually as a prospective capitalist herself. The article makes a distinction between readers of James Joyce and the community of Joyce scholars and addresses itself primarily to the former. It describes the location and format of the 2016 Symposium and mentions some of the subject areas of papers presented. The author puts forward a subjective categorisation of the approaches to Joyce studies. Some of the sessions are discussed in detail with a view to giving readers an insight into the atmosphere and proceedings of the conference. You can read the full article here. Ian Garvie was casual reader of Joyce until June 2003 when he was involved in organising a Bloomsday event in Leeds. This led to many re-readings of Ulysses and an exploration of the scholarly literature. 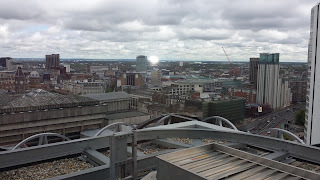 Subsequently, running a local reading group and attending Richard Brown's Finnegans Wake group in the School of English at Leeds University has deepened his appreciation of Joyce's achievement. At the University of Huddersfield 9-10 September, this conference is for anyone interested in urban space and/or walking. There are talks and walks for all the family. All events are free, but some need to be booked due to numbers. Held at Heritage Quay. Click here for full programme and you can find out more about my own talk here. Travis Elborough and John Rogers walk around Victoria Park in London and discuss the history of parks in the UK. Click here for the 30min film. 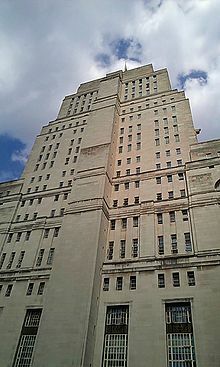 Travis will also be the keynote speaker at the Fourth World Congress of Psychogeography (above). You can read an article by Alex Bridger, Sophie Emanouil and Rebecca Lawthon about a psychogeography project carried out at a local arts/community project: “This project was driven by three aims, which were: to do community group-work in order to produce contributions both inside and outside of the University; to use a psychogeographical approach to playfully critique everyday life in consumer capitalist society, and finally, to consider the extent to which wider personal and political changes could be enabled.” Click here for the full article. A festival of urban exploration in London 22-25 September: “4 days of stimulating urban exploration, talks, dialogues, discussion, exchange and artistic interventions, about and on London’s new spiraling pathway.” Click here for the details. Interview with Sam Cooper, Author of The Situationist International. You can access some extracts from Laura Oldfield Ford’s Savage Messiah here. You can find out more about Travis Elborough and Alan Horsfield’s new book Atlas of Improbable Places here. And you can read about Simon Springer’s new book The Anarchist Roots of Geography here. You can read the following by clicking on the links: The National Trust celebrates brutalist buildings, the history of graffiti, and John Rogers and Iain Sinclair look at London’s Mounds.